What Can I Do with a Belt Canvas? So you’ve decided to stitch a belt. Now you have to make some decisions about finishing it. If you decide to finish it as a needlepoint belt, you have a couple of options, somewhat dependent on the waist size of the person wearing it. Most belt canvases are about 38″ long. If the belt needs to be longer than this, your only option is to make a traditional belt with leather ends. Several companies have information about how to prepare your belt canvas for this, including eHow, Needlepoint Belts, and others. This is a specialized finishing service so you will need to have the leather end belts professionally done. Some companies who do this include Pinnell Custom Leather, The Meredith Collection, and Voila!. Voila offers many styles of belts beyond the leather tips and buckle. Go to your local shop to work with these companies. 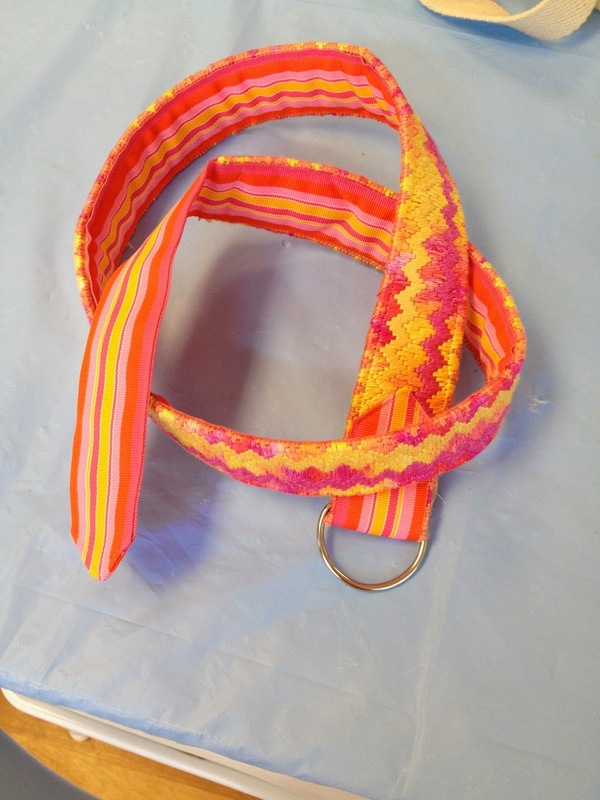 If you choose to finish the belt yourself, you will need to finish it like a ribbon belt (picture above). The raw ends of the needlepoint will need to be turned under and the belt should be stiffened with interfacing and lined with ribbon. Although the needlepoint is thicker than ribbon, the procedure for finishing is the same. Your results will be similar to the bottom picture above. But what if you don’t want a belt? There are plenty of other things you can make from this long skinny canvas. To wear you could make a bracelet, headband, hat band, sandals, key fob, or a purse (Voila! has many creative ideas for this). You can turn it into a camera strap or a purse strap. For your home, why not do my favorite, making a band to decorate the top of a basket. So what if it ends up being a “breakup belt?” You can still make it a stylish part of your life. I framed the Liz belt of the ocean with the lighthouses and seals. I hung it over my front door, so people saw it going out. It looks great! Recently had half of a belt canvas put on the bottom of a clock. Have also seen beautiful results across the top or bottom of a coat rack or around the rim of a tray. Blessed my LNS has a finisher that provides these services.